A new partnership could reduce the concerns dealers might have with adding higher-mileage vehicles to their inventory. DealersLink, an automotive systems integration and networking technology company, announced the partnership last week with vehicle contract program company Alpha Warranty Services. The companies say the partnership will give DealersLink members the ability to add Alpha Warranty Services’ high-mileage warranties to units directly from the vehicle details page. The ability of DealersLink members to add Alpha’s high mileage warranties directly from the VDP will allow dealers to estimate the cost of a warranty to the consumer, while determining the profit realized from selling an extended warranty, DealersLink noted in a news release. DealersLink notes that it has worked to eliminate wholesale transaction fees for more than 13 years, with $1 billion of used inventory available 24 hours per day, seven days per week. Members using the Marketplace can stock their lots with reconditioned units, locate hard-to-find vehicles for their customers, sell inventory without incurring wholesale losses, and arrange book-for-book trades, according to DealersLink. Members pay only a monthly fee to participate, and never pay per-vehicle auction fees. “DealersLink has completed the integration with Alpha that will instantly generate per unit warranty quotes for DealersLink members inside the platform,” DealersLink chief executive Mike Goicoechea said in a news release. Ty Kielblock of Alpha Warranty Services added in a news release that his company’s warranties work to give the consumer and dealer peace of mind with high-mileage vehicle purchases. CDK Global, a provider of integrated information technology and digital marketing products to the automotive retail and adjacent industries, says its products automate and integrate all areas of the dealership and buying process. That includes targeted digital advertising and marketing campaigns and the sale, financing, insuring, parts supply, repair, and maintenance of vehicles. Updates to its Fortellis Automotive Commerce Exchange Platform is one of those programs. CDK announced the launch of Fortellis Marketplace, a central hub, similar to app stores in other industries, where retail technology providers can sell their software applications to dealers and OEMs. CDK Global also announced that it will eliminate access fees for Fortellis, which CDK says is the world’s first open, agnostic platform for the development and marketing of automotive application programming interfaces (APIs). CDK says the Fortellis technology platform and its Developer Network and Marketplace connects software developers, OEMs and dealers, which the company says helping them create new experiences efficiently. Also at NADA, CDK introduced the next generation of its Dealer Management System (DMS), called Drive Flex, which the company is describing as a first-of-its-kind web-based DMS. And in yet another CDK announcement during the time period of the NADA show, the company said Dealer Intelligence, an automotive industry platform for enterprise business intelligence, reporting and analytics, has become a participant in the CDK Global Partner Program. What’s the impact of that innovation, integration and personalization? The company says car buyers will find the resulting streamlined customer experience at the dealership to be useful. The company says eliminating access fees for Fortellis will also be useful and that it will spur innovation. CDK will charge no fees to join, to publish APIs, gain access to basic reporting and support, or to market different products to users. The company will charge a nominal transaction fee, but the company notes that with more than 120 organizations becoming active users of the platform, that has created a “thriving community” that has contributed 90 registered products and 70 active sales opportunities, as well as an increasing number of APIs being published. Discussing the next generation of the Drive Flex DMS, Rajiv Amar, executive vice president and chief technology officer, CDK Global, elaborated on his statement that the product is modernizing automotive retail. The company says Drive Flex’s workflows allow dealers to hire top employees regardless of their prior DMS experience. The next generation of Drive Flex is available to dealers with one or two locations, with what the company says is an improved user interface, reduced installation times and minimal learning curves. Finally, regarding the news that Dealer Intelligence will participate in the CDK Global Partner Program, CDK noted that Dealer Intelligence will now be part of a marketplace of applications and integrations that CDK developed to help automotive dealers succeed. CDK adds that joining the CDK Global Partner Program is important for DI to provide dealerships with a next-generation enterprise Business Intelligence platform and that by accessing DMS data seamlessly, reliably and in near-time, DI can provide customers with the actionable intelligence they need to optimize their financial and operational performance. "With DI, you don't have to pull your team away from the business for days of training. DI is also universally affordable," Farra Majid, CEO and cofounder of DI, said in a news release. "Obtaining CDK certification is a significant milestone for us. We're excited about helping dealerships to more profitably and efficiently manage their businesses with actionable intelligence through tomorrow's business intelligence platform." The company says its DI Business Intelligence platform offers dealers near real-time financial and operating performance management at every management level and across every department. After 31 years with Larry H. Miller Group of Companies, including the last four years as chief executive officer, Clark Whitworth is leaving Larry H. Miller Group to serve as a mission president for The Church of Jesus Christ of Latter-day Saints. Whitworth will stay on as chief executive officer through the transition process as LHM’s board executive committee begins a search for Whitworth’s replacement. The board will consider internal and external candidates. The company notes that it has experienced “tremendous financial and operational growth” during Whitworth’s time with the company. “I am very thankful and appreciative of the work Clark has done over the past 31 years, including the last four years as CEO,” Gail Miller, chairman and owner of the Larry H. Miller Group of Companies, said in a news release. Whitworth and his wife, Jennifer, will oversee the missionary and service work of about 500 full-time individuals in the Villahermosa Mexico Mission. The Whitworths will serve for a three-year period starting July 1. We are getting closer to becoming a one-price society. Why? Because people want things automated. Rick Ricart believes that, but the president of Ricart Automotive Group in Columbus, Ohio, also feels that if buyers want automated and fast transactions, then those buyers give up negotiation. “That’s what the trade-off is,” said Ricart, whose grandfather started the company in 1953. When they understand how dealers price their vehicles, customers feel comfortable committing, buying and “Docusigning” the initial paperwork, he added. “Then we as a dealer simply call them and congratulate them and ask them if they would rather us bring the vehicle to their home or place of business and deliver it there, or would they like to come to the dealership and celebrate taking delivery. It will be approximately 45 minutes. We get 100-percent response that they would like to come to the dealership, knowing it will only take 45 minutes,” Ricart said. That 45-minute service is part of a new program called Express Checkout, which lets shoppers find the vehicle they want, plan payments, line up financing and buy the vehicle online. Ricart Automotive served as a pilot business for AutoFi’s Express Checkout program, and Ricart helped further develop the product for AutoFi, which is an online auto financing platform. Express Checkout is now available for all makes and models, new and used, that Ricart Automotive sells. The program has shortened the time customers spend in the dealership from an average of three-and-a-half hours to only 45 minutes, and more than 200 customers used the platform from approximately September through November to purchase a vehicle from Ricart. The 100-percent response from customers saying they would like to come to the dealership dispels what Ricart says is an industry myth that people want their vehicles delivered to them. Customers are actually comfortable going to the brick-and-mortar. He heard industry reports throughout his years in business regarding customers’ No. 1 complaint about the process of buying a car: It takes too long. Choosing the vehicle they want and test driving it is time-consuming in itself, but then a bank or lending institution usually gets involved, and the dealer must put together all the necessary paperwork for the customer to review and sign. Implementing all of those steps into an automated format was the next “innovation step,” Ricart said. He heard about AutoFi and learned that its founders started the company because they were unhappy with their own car buying experience. After meeting AutoFi chief executive and co-founder Kevin Singerman and chief technology officer and co-founder Mandar Gokhale, Ricart agreed to have his business serve as a pilot dealership for the Express Checkout program. “The end result these guys built is a fully automated online transaction tool,” Ricart said. When customers click that button, the system prompts them to provide identifying information and see what their actual payment amount would be. The system sends the customer’s credit information to lending institutions. Ricart noted that subprime banks are also joining the program. “It’s a big benefit for a lot of consumers who maybe have challenged credit and don’t want to waste the time to drive to a showroom and have the embarrassment of being told no,” Ricart said. The customers can sit at home, pick the car they want and see if they qualify for it. If they don’t qualify, a Ricart representative will contact them and let them know what their options are. Ricart remembers the Great Recession of 2008-2009 causing the closure of many automotive dealerships. He believes the industry’s failure to embrace the Internet was a main reason for the problems. “Those dealers weren’t prepared for change,” he said. “They weren’t prepared for a new way of doing business. We have to be great at our business today, but we have to continue to keep an eye on the future and be willing to adapt quickly and listen to what our consumers are telling us. He feels dealers should look at the Wal-Mart store chain business model in the move toward innovation. He notes that customers of Wal-Mart stores can conduct business directly at the retail location. They can buy online and pick up merchandise at the retail location, or they can buy online and arrange for the merchandise to be delivered to their home or business. That concept of multiple options is where the automotive industry is headed, and franchised car dealers should work to stay on the forefront of that trend, Ricart said. Express Checkout is the “biggest innovation message I feel we’ve had in eight years,” since the company got involved with Motor Trend Certified program in 2010, Ricart said. The Express Checkout message is that you can do as much or as little from home as you want, he noted. EDITOR'S NOTE: This is the second in a two-part feature on Rick Ricart and Ricart Automotive Group. Part I can be found here. The third paragraph of the second section has been updated to reflect that the Express Checkout is now available across all new and used makes and models that Ricart Automotive sells. In 2016, when Ricart Automotive sold 8,000-plus used vehicles, Rick Ricart figured: “We really don’t need to sell more used cars; we need to do a better job with the number we’re selling” and gross profits. But when the dealership group sold virtually the same number of used vehicles in 2017, Ricart concluded that those sales numbers, though good, weren’t good enough. So on July 1, the company embarked on a massive restructuring program. Among other things, Ricart is beefing up his service and reconditioning capacity and in September, rolled out Express Checkout, a new online auto buying and financing tool created by AutoFi, a financial technology company. Express Checkout enables buyers of some new- and used-vehicles to complete most of their vehicle purchase including financing online without visiting the dealership. As a result of the overhaul, the group’s used-vehicle sales retreated somewhat to 7,496 units in 2018, Ricart said. But now, Ricart Automotive has a new 2019 used-vehicle sales goal: 8,500 to 9,000 units, with at least 1,000 of those units being sold in a single month that has five weekends. “If you’re not wanting to grow and improve, it doesn’t work,” said Ricart, 39, during an interview at Used Car Week in November. “If you improve and increase, it helps the culture, it keeps people motivated. Sales is an emotional business — it’s no more than the transfer of emotion from one person to another. Ricart Automotive was started by Ricart’s grandfather, Paul Ricart Sr., in July 1953. Ricart began his career in retail automotive as a lot attendant at his family’s business when he was 15. He started selling new Chevys full-time at age 21 in 2002 before rising though the dealership management ranks. The third-generation dealer was the group’s vice president and director of sales and marketing prior to becoming its president in September. That’s when Ricart’s uncle, Rhett Ricart, was elected the 2019 vice-chairman of the National Automobile Dealers Association. Ricart Automotive operates Ford, Nissan Hyundai, Kia, Mazda, Mitsubishi and Genesis new-car franchises. The company also operates its stand-alone Ricart Used Car Factory, which specializes in Motor Trend Certified used vehicles. It also sells a “handful” of used vehicles under factory CPO programs when it’s “advantageous” to do so, Ricart said. Ricart Automotive embraced the Motor Trend Certified program because it has a “strong” industry name and quality message, Ricart said. It also enables the group to use one certified inspection process most of the time and to consolidate its reconditioning operations, he added. Speaking of reconditioning, expanding its technician staff is among the ways the dealership group plans to expand its used-vehicle sales. As part of the restructuring, the company promoted a leading shop foreman to the newly created position director of technician development. The director of technician development spends about half of his time training and developing the group’s current technicians; the rest of his time is devoted to seeking and recruiting new technicians. So in addition to having a reconditioning shop for used vehicles, seven new-car franchises mean that Ricart Automotive has seven new-car service departments, Ricart said. The company also has a medium and heavy-truck department, a fleet service department and a hot rod performance shop. That gives technicians room to move around within the company and try something different, Ricart said. Workplace variety helps keep some technicians energized and lessens the likelihood they can be lured by other dealers who are heavily advertising for technicians and courting them with aggressive offers, he adds. “When you sit down with technicians and ask them why they are considering leaving, sometimes an environmental change and a different building or position reenergizes them,” he said. Ricart is also counting on Express Checkout to help the group reach its used-vehicle sales goal this year, he said. Ricart piloted the program for about 18 months with AutoFi and Ford before implementing it last fall. Express Checkout is available on the new and used Ford, Hyundai, Nissan and Mitsubishi vehicles sold at Ricart Automotive, Ricart said. EDITOR'S NOTE: This is the first in a two-part feature on Rick Ricart and Ricart Automotive Group. Part II can be found here. Thousands of viewers in person and watching on television saw an exciting NCAA football game as the Tulane Green Wave defeated the Louisiana-Lafayette Ragin’ Cajuns, 41-24, in the AutoNation Cure Bowl at Camping World Stadium in Orlando this past Dec. 15. But for automotive retailer AutoNation, the game served as great publicity. Sports fans saw the AutoNation name associated with the event and charitable giving. The Cure Bowl is part of AutoNation’s Drive Pink campaign, which raises money for the Breast Cancer Research Foundation. “We have used sports to push our brand and to do community service as goodwill in the markets where we live and work,” said Marc Cannon, chief marketing officer and executive vice president for AutoNation. Larry H. Miller Dealerships is another example of how the automotive industry and sports organizations are benefiting from partnerships with each other. About six years after starting his dealership group, Larry H. Miller acquired one-half of the Utah Jazz NBA basketball team in 1985. He later became sole owner of the Jazz, and his family has owned the franchise since he died in 2009. Miller “saw that there were connective tissues between a competitive sports franchise and car dealerships,” said Paul Nygaard, senior vice president of marketing for Larry H. Miller Dealerships. How do they connect? “In the desire to achieve things, the desire to satisfy customers … those things are all competitive. There were things he viewed that were important to have in both,” he said. Miller saw connective tissues between sports and auto dealerships early in his career, when he was hired to work in the parts department for an auto dealership in Denver, and he also pitched for the dealership’s softball team. He went on to a stint as a professional softball pitcher, and he eventually acquired various auto dealerships that formed the Larry H. Miller Automotive Group. “The competitive nature that sports brought out is what kept driving him to acquire and grow businesses,” Nygaard said. Miller also loved basketball, and his ownership of the Jazz has been beneficial to his dealerships. During basketball season, it’s a sports news story almost every night. “It’s kind of a simple statement, but … someone buying a car is improving their life, someone going to a Jazz game, they’re enjoying themselves,” Nygaard said. As part of its “vision” to be the best place in town to work and to do business, the company gives Jazz tickets to those who purchase cars from Larry H. Miller Dealerships. And as part of its “values” of hard work, stewardship, service and integrity, Jazz players and dealership employees donate their time to charity. At a recent event, players Georges Niang and Royce O’Neale of the Jazz joined dealership employees in helping to serve turkey meals at a Utah shelter. Miller’s sports involvement doesn’t stop there. The company is a title sponsor of the Larry H. Miller Tour of Utah professional cycling event. The seven-day race travels throughout Utah, accompanied by caravan vehicles from the dealerships that display the company name. “It … has a benefit to the communities that it rolls through and helps provide a great deal of recognition and awareness for us,” Nygaard said. The Miller family also owns the Salt Lake Bees Triple A baseball team and the Salt Lake City Stars NBA development league team, and it is a corporate sponsor of the University of Utah athletic program and others. In terms of finding areas in which it could get quality exposure, AutoNation has found sports and arts as vialble options, “where you can make a mark for yourself, and you can reach a vast audience, and in many cases or most cases, exactly the buyer you’re looking for,” Cannon said. The company launched its Drive Pink initiative, with help from auto racer Ryan Hunter-Reay, whose mother died of cancer. That led to the AutoNation Cure Bowl. Then the company partnered with race car driver Jack Harvey, who expressed a strong interest in cancer causes and participated in another AutoNation advertising campaign. AutoNation’s affiliation with sports has helped people in need, and Cannon likes to talk about how sports helps push the AutoNation brand. The late AutoNation founder Wayne Huizenga owned the Florida Marlins (now known as the Miami Marlins) baseball team and the NFL’s Miami Dolphins. “But that’s not how we got into sports. We got into sports because we’re good branders and we see the marketing capabilities,” Cannon said. That will continue as AutoNation participates in various sports sponsorship programs, including a vehicle giveaway program involving the Marlins. EDITOR'S NOTE: This is part of Auto Remarketing's “DRIVING FORCE: The Business Intersection of Sports & Automotive” series, which will discuss the car industry's involvement in sports business — be it through marketing partnerships, ownership stakes, working as sister companies under the same corporate umbrella or other business ventures. 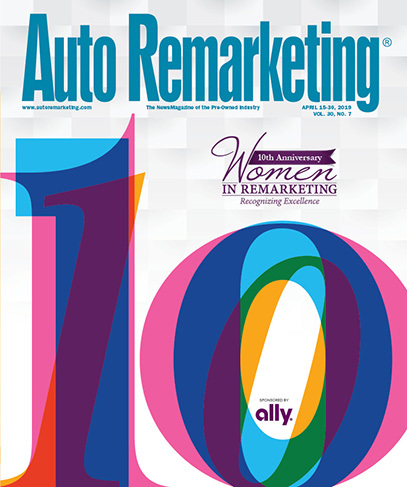 Stay tuned for the print edition of this series in the Feb. 1 edition of the Auto Remarketing magazine. There are lots of opportunities for innovation in the used-car space for dealers. In fact, some may say it is a hotbed for new ideas. “I think a lot of the most exciting trends in automotive buying are going to be led by used-car retail,” Aaron Krane, the chief executive of Drive Motors, which develops online car-buying solutions for dealer groups and banks, said in a phone interview. One example is the work dealers are doing with Drive Motors, which gives dealers a way to turn existing websites and stores into digital buying platforms. “But that’s only one, let’s say, vector of innovation that used dealerships are exploring. That’s the one that we happen to offer, but there are others as well,” Krane said, going on to mention things like on-demand test-drives and retargeting. Over at the EchoPark Automotive line of used-car standalone stores (the focal point for Part I of this story) one potential area for continued innovation is online sales. Jeff Dyke, who is president of EchoPark and parent company Sonic Automotive, said in a November interview that EchoPark prefers for 90 percent of the deal to be complete before the customer gets to the store. They have not yet launched tools that would let the consumer do the entire transaction online (as of that interview), but at the time of that interview in late November, Dyke was set to show that technology to the executive team. One of the pluses to the technology that EchoPark and Sonic have is that they utilize their own appraisal system, whereas most companies that sell cars online use an outside system, Dyke said. With EchoPark’s process, customers would be provided a car-cash app through the app store, where they would take a photo of their vehicle, just as an EchoPark associate would at the store. “They can fill out the same condition report, and it will go straight from the customer to our RTC, and our RTC will respond back to the customer,” Dyke said. “And so they’ll get that information, and then they can complete their own transaction online, set up their own financing, do everything right there online. We’ll sell them the products online, the whole nine yards,” and then the consumer can pick up at store, he said. As for delivery, there “probably” will be a day where that happens, but it makes things more complex, and they’re not quite there yet, Dyke said. “I’ve got five priorities in my new role as president of this company, and one of them is to be able to sell online — but to do it really good, and to have the same experience, the same culture in your Web visit as you do in your brick-and-mortar visit,” Dyke said. Sonic’s peers certainly have noticed the importance of this space. AutoNation was the lead investor in an $146 million funding round for online car retailer Vroom, which officially announced the Series G round in December. AutoNation had announced its piece of the investment in late October, saying it obtained roughly a 7-percent ownership stake in Vroom after a $50 million strategic investment in the online car retailer. With its $54 million investment, Lithia led the $140 million round of Series D financing in online marketplace Shift that was announced in September. Lithia and Shift also formed a strategic partnership, and Lithia president and chief executive Bryan DeBoer joined Shift’s board of directors. In October, Lithia said it had acquired more equity interest in the online marketplace. Some groups might utilize third-party platforms, some might utilize subscriptions, while others might bring online buying to their existing experiences, which Krane believes will be most common. A walk through the customer-facing side of the EchoPark Automotive store in Charlotte, N.C., has the feel of a cafe, not a car dealership. The employee work area, separated from the consumer-facing front, has the trappings of a young, tech-leaning startup. But the innovation of this store and its fellow EchoPark locations go well beyond appearance. These standalone used-car stores, launched by the publicly traded Sonic Automotive dealer group, take a new approach to auto retail — perhaps representing, on a larger scale, the shifting sands of how dealerships operate. This innovative way of thinking was evident in a late November interview at the Charlotte store with Jeff Dyke, president of EchoPark and Sonic, and Sanjay Prakash, the location’s general manager. Everything from inventory pricing to employee management at EchoPark is a bit different than what you might find at a traditional car dealership. Take, for instance, how these stores find inventory. “We source everywhere, but we try to buy in bulk,” Dyke said. “And the best way to sort of think about how we buy is, you go to a meat market. “And at the meat market, there’s chicken and steak and hamburger and sausage and you name it,” he said. “We look for what’s on sale today. “We don’t necessarily buy to a, ‘Hey, here’s what the customer wants’; We buy to a price-point, so that we can create a really low price-point that brings the consumers into the store,” Dyke said. “And that’s everything — you’ve got to get the right price on a car. Establishing a rhythm in buying is key in inventory management for EchoPark. So is consistency. Buying to a number. And not over-buying. “You’re going to sell more cars on a Saturday than you do on a Thursday, but we know those rhythms, so we buy in conjunction with that,” Dyke said. “And we try not to over-buy; we do have projections for what we think we’re going to sell the next week, and we try to buy to that number. And then the next week, buy to that number. So, too, is pricing of that inventory, which Dyke said is based on algorithms built internally and on data points from what is happening in the market. An example of that is the electronic hangtags on the vehicles. When the company’s internal pricing system changes the prices, that change is automatically reflected on the hangtag. The EchoPark managers don’t have to worry about buying inventory or pricing cars. The fact that the majority of the technology at these stores was developed internally means that making changes is typically easy, inexpensive and efficient, Dyke said. Innovation, as it turns out, can be an evolving process. Since launching EchoPark Automotive in 2014, Dyke said there have been a number of lessons learned about how these standalone used-car stores should operate. For instance, days’ supply should in the low- to mid-20s at the stores, as opposed to the 29- to 32-day range for Sonic’s new-car business. Also, pricing right from Day 1 is paramount. Don’t overbuild. “We tried to put this exact process in our new-car stores. But to take that culture and to convert it into this culture with the same people? Mistake. We learned that. You can’t do that,” Dyke said. “We’ve taken the technology out of the new-car stores and put it in here; that’s worked very well. But certainly, hiring from day one and testing and making sure that you’re bringing the right people into the organization and lots of training before you open — it’s been an earmark for us from day one, but it’s just gotten a lot better as we’ve moved forward,” Dyke said. “The people piece, the inventory piece. Don’t overbuild the facility,” he said, pointing out that a facility can be nice without being massive. “And we don’t have to have tons of people. Our technology allows us to sell two-and-a-half times what a traditional salesperson would sell in a regular store” where an associate might sell eight to 10 vehicles a month, he said. “It’s not about how many people you add; it’s about how efficient you can be,” Dyke said. As far as store additions, the company aims to open one more location in March, putting its EchoPark store count to nine, and then they will likely “take a breather” for the rest of 2019 to focus on execution, Dyke said. “What we want is for the nine stores to be profitable, and when we add a store … we stay profitable, and then you just build on that,” Dyke said. Starting next year, Sonic plans to start adding two to five stores annually, “depending on what our capabilities are and the performance of the organization,” he said. They want to grow, but do so profitably. “Speed to market is really important, but when you have a formula like this, and you know that you can open up a store and it’s going to sell 300 cars and it’s a very, very good chance that it could break even in its first month, I’m not worried about the rest of the world anymore,” Dyke said. “I’m worried about how much can our people take on, and how much complexity do we put in front of them, how simple we can make it and the ease of opening stores,” Dyke said. Another competitive advantage that EchoPark prides itself on is its workplace culture. Instead of spending 30 percent of his time working with employees and 70 percent on other tasks, Prakash said he spends 90 percent of his time coaching, teaching and working with the team at the EchoPark Charlotte store. “That’s really good to see as a GM and a leader of the team to see that we’re living the values. And to Jeff’s point, it’s about reducing complexity. I’m allowed to focus on a lot of the activities that generate that,” Prakash said. “I don’t have to interact with a lot of guests, if I provide them with this, just like Jeff provides it for me, they’re going to automatically be engaged every day. For more, see Part II of this story. Consumers want a car-purchase process that is seamless, streamlined and limits their in-dealership transaction time to an hour or less. That means allowing consumers to compare interest rates, electronically sign credit applications and other documents and shop for finance and insurance products all on a dealership’s website before stepping foot into the dealership. OK, so the industry isn’t completely there yet — but some financial technology is. That was the general consensus of financial industry experts, technology providers and other big thinkers, who gathered for Used Car Week in Scottsdale, Ariz., Nov. 12-16. “We’ve defined the problem quite well; consumers want the information; they want a fast transaction; they want to have it all arranged before they get into the dealership, but I don’t think we’ve totally solved for that,” said Andrew Stuart, president and CEO at TD Auto Finance, during a sideline interview at the conference. In its search for solutions, TD Auto Finance has been in talks with a number of financial technology startups and struck a deal to become a preferred lender with AutoGravity, a digital vehicle-shopping and financing platform, Stuart said. “As lenders we’re going to have to make a number of small bets with some of these fintechs that are trying to solve for what consumers want,” he said. Also seeking solutions is Cox Automotive. Take consumer credit applications, for example. Andy Mayers, Cox Automotive lender solutions strategist, said credit application information is typically gathered from consumers and then entered into dealership computers by dealership F&I managers. But credit applications submitted on dealers’ websites by consumers using Cox Automotive’s Accelerate digital retailing platform saves time, even if it would have taken an employee just five minutes to enter the information, he contends. “If you sell 100 cars a month, that’s 500 minutes you just saved by having a consumer enter that data,” Mayers said, during an interview. Mayers also said dealers are open to giving consumers more information about F&I products online, but worry that F&I sales, a major profit source for dealers, will suffer and consumers will miss out on valuable products. To bridge the consumer’s online and in-dealership experience, Cox Automotive’s Dealertrack created uniFI, a dealer-facing software platform that integrates with Accelerate, Mayers said. As an open platform, uniFI can facilitate the entire car-buying journey of credit, contracts and aftermarket sales, he said. Though much of the vehicle purchase process, such as trade-in appraisal, test drives and vehicle registration and titling paperwork, are typically conducted at a dealership, “technology is getting there,” when it comes to allowing consumers to do it themselves online, Mayers added. Also on that panel was Jim Money, president of Automotive Finance Corp., who said taking advantage of things such as artificial intelligence and mobile apps “take the mundane out of the process” and help streamline the wholesale vehicle buying and selling for dealers. “Mobile technology is extremely important,” he said. “It allows the dealer to buy and sell (used vehicles) and pay down and gather information on their accounts. Fintech was a hot topic among auto finance executives during a panel discussion that honored them as leading Women in Auto Finance. Katherine Adkins, Toyota Financial Services group vice president, general counsel and secretary, said fintech is dramatically changing auto finance. She said companies that don’t adapt and grow risk being among the “Kodaks of the world,” referencing the once-dominate camera company’s near-death experience resulting from its failure to switch its photographic technology from film and paper to digital. Adkins also cautioned that financial technology is way ahead of regulation, which could eventually present problems. “The rules aren’t written yet and the business wants to go there. So how do you facilitate them going there without setting up a situation where you end up hurting yourselves?” she said. Panelist Sharon Mancero, senior vice president, Wells Fargo Preferred Capital, predicts that technology will be at the forefront of career opportunities available in auto finance, but agreed that more technology will create more legal and compliance issues. “The more we lead with technology, the more we go ‘ooh, nobody ever thought about; what do we do with all this data?’ she said. Georgine Muntz, board of directors member, defi SOLUTIONS, a provider of loan origination software, said the industry is being challenged by a lack of agility and outdated technology. The industry must become nimble and take advantage of the new technologies for payments and electronic documents, said Muntz, who was also a Women in Auto Finance panelist. “These are the things we have to take a hard look at and find ways through legal and compliance to allow for these changes to happen,” she added.